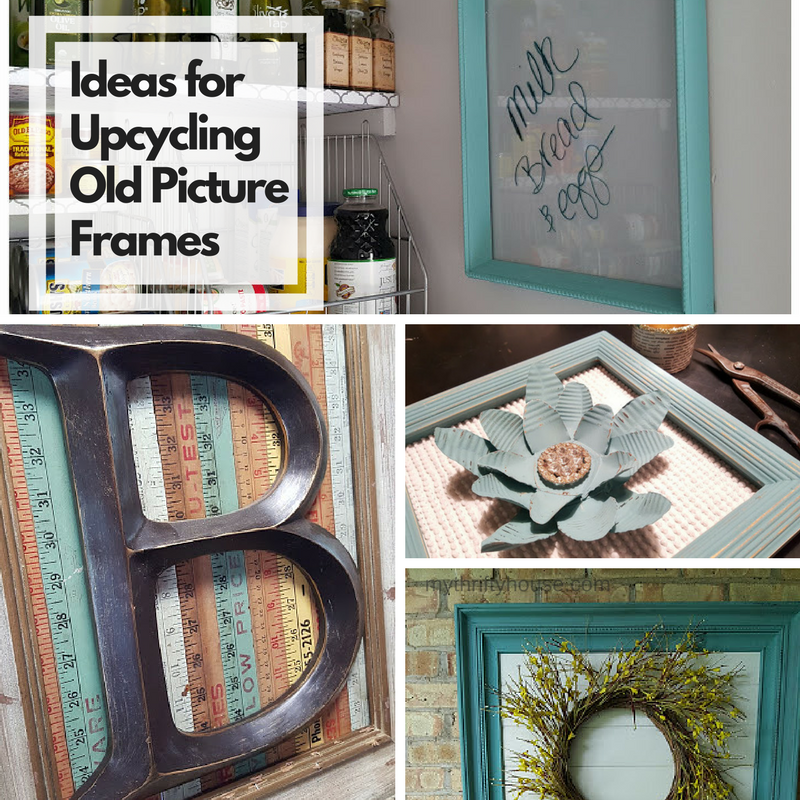 Today the Farmhouse Hens are featuring frame projects and I am so very excited to share my ideas for upcycling old picture frames. I am a huge fan of recycling, repurposing and reusing an item to keep it from the landfill. 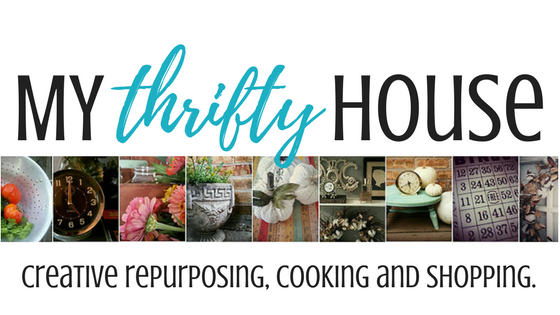 While strolling the aisles of the thrift stores and flea markets, I keep my eyes open for things that I can purchase inexpensively and give them a makeover. Picture frames are something I never pass up. 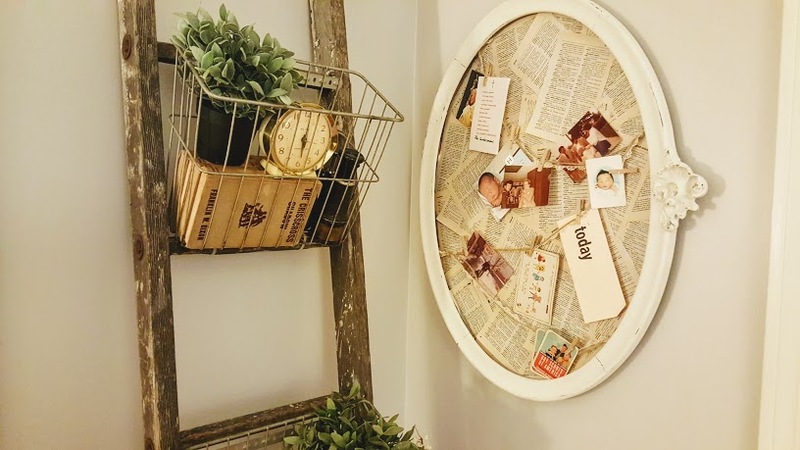 If you were to walk through my house you would see that upcycling old picture frames is one my favorite ways to add some inexpensive character and charm to my home. 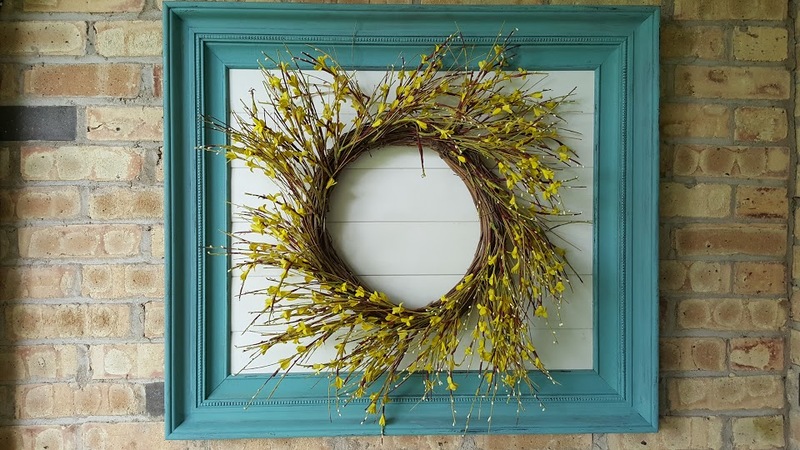 Who doesn’t love unique and inexpensive décor? 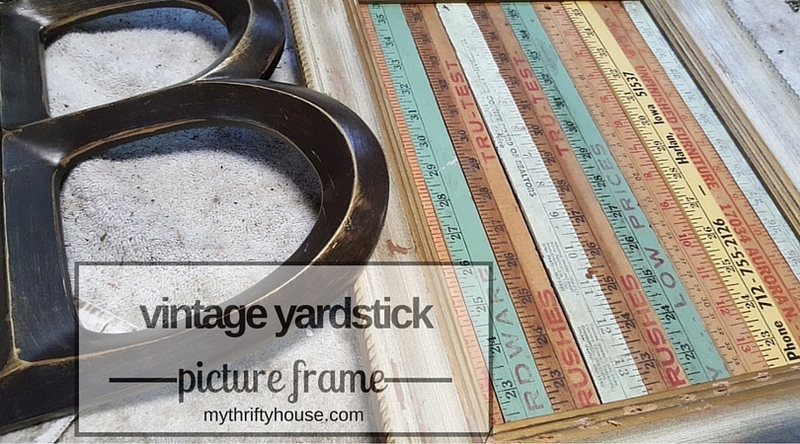 Let’s take a virtual tour and I’ll show you how I am repurposing my growing collection of picture frames. 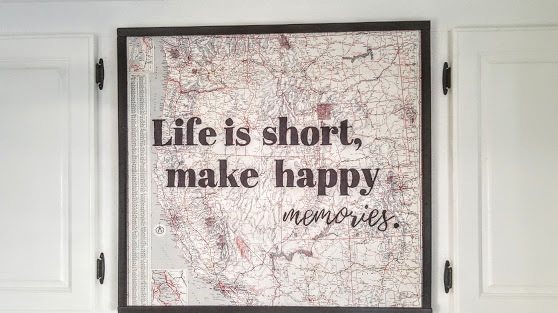 I started a gallery wall in my modern farmhouse kitchen and this yardstick picture frame is a great addition to the wall. I love the colors and the typography on the yardsticks and the weathered frame. 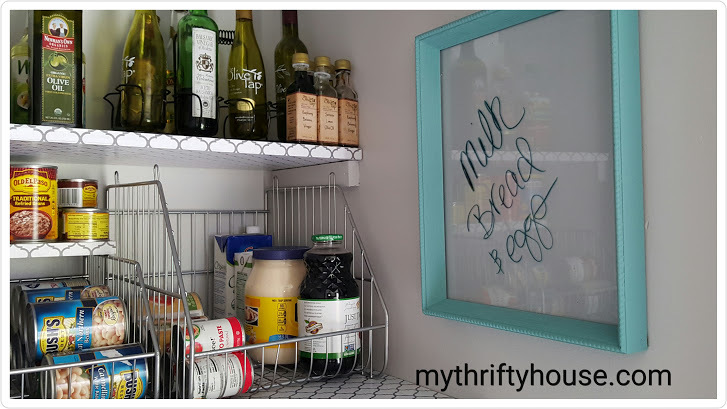 When I did a pantry makeover for less than $50 I added this dry erase board made from an empty picture frame that I painted with my homemade chalky paint. I love having this in the pantry so I always know what I need for meal planning. 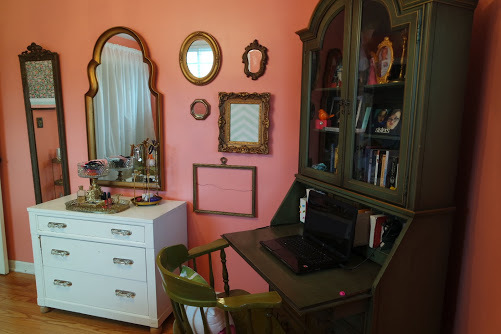 When I did a makeover for my teen daughter’s bedroom, we added a gallery wall of vintage gold frames and mirrors. She chose the color scheme, I shopped my house, added some DIY projects and we love how the whole room turned out. I have taken upcycled picture frames into our glamper too. 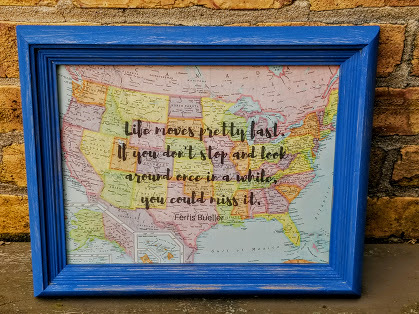 When I did a makeover of our glamper living room I added this old frame that now holds a vintage map page with my favorite Ferris Bueller quote. 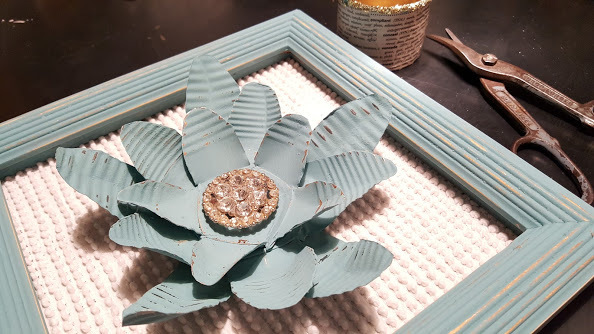 This flower was made from 3 tin cans and I added it to an old picture frame lined with leftover fabric from my chenille pumpkins. This memo board was made from a vintage frame I picked up at the flea market and it’s lined with old dictionary pages. I’ve also taken my picture framing habits out to the front porch. This large frame sat in storage for years and it was upcycled with leftover slats from a window blind. I change out the wreath with the seasons. This is a large board covered with a vintage map and the simple black frame was made from scrap wood. The quote was hand lettered using a simple technique with Sharpie markers. This artwork hangs in our glamper where there used to be a TV. 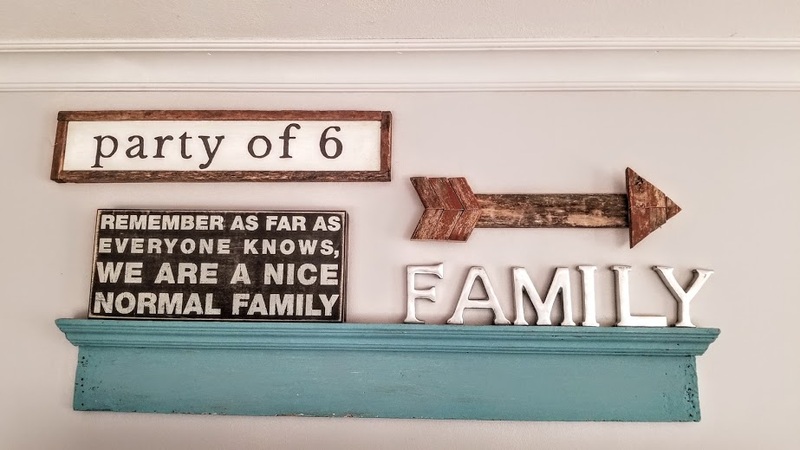 This “party of 6” farmhouse sign was completely made out of scrap wood and hangs in my living room as a reminder that we will always be a family of six even though my son has gone to heaven before us. 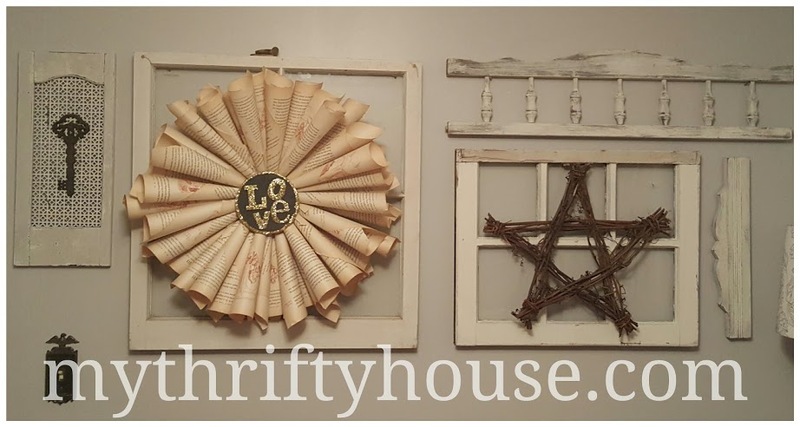 In my office I have used an old window as a frame for my vintage book page wreath. 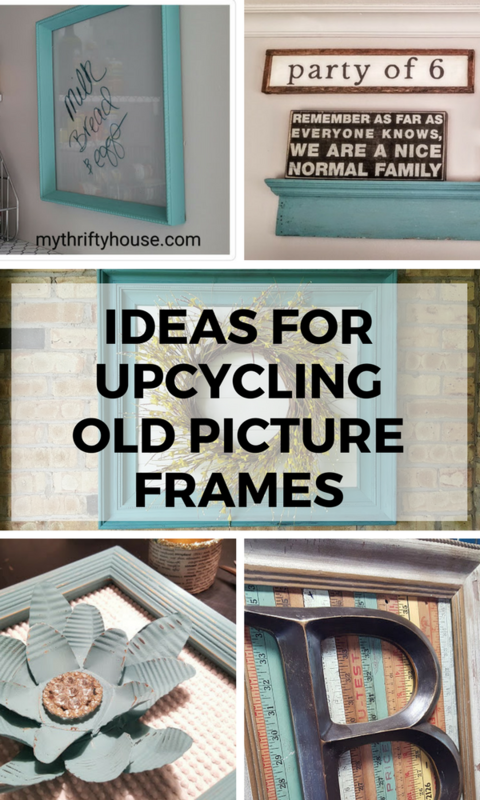 Those are just a few ideas for upcycling old picture frames and I hope that I have inspired you to think about incorporating some of these ideas into your home decor. Keep scrolling to visit the Farmhouse Hens below and be inspired by there amazing creativity. Good grief, you are creative with making DIY art. Such a gift because artwork can be so expensive, or obviously mass produced and boring. These frames and the artwork within them are simply fantastic. The list for the pantry is happening at my house soon. Awww….thanks my sweet friend. I can’t handle purchasing something that I know I can make myself. Loving all of these ideas. What is it about old yardsticks or rulers that makes them so beautiful. Sigh. I know!!! I am a sucker for yardsticks and always buy them at the flea market. Oh wow! What an awesome collection of frames you have made! Love them all to bits! Still love all of your yardsticks too!! Love these great ideas! The world map is one of my favorites & I also love, love the yardstick idea! Great ideas! I love every one of these ideas!